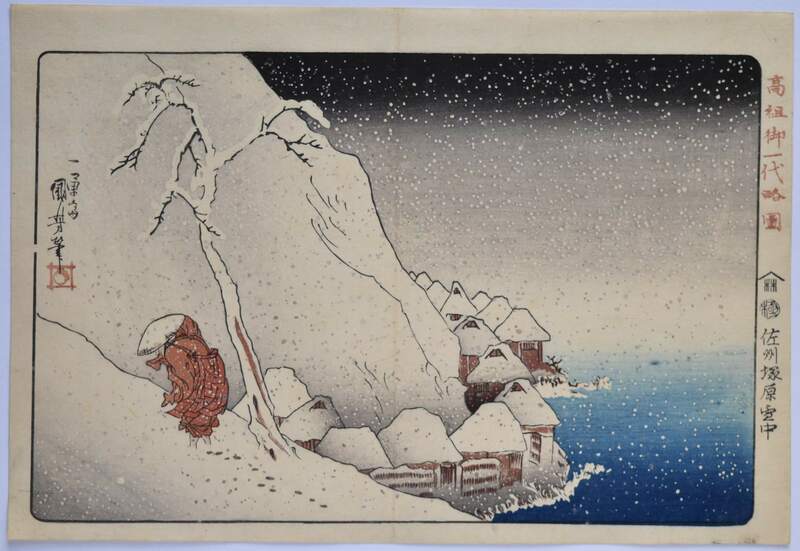 Nichiren struggling up a snow-covered mountain near Tsukahara on the Island of Sado. The best design from Koso goichidai ryakuza, the “Illustrated Abridged Biography of the Founder.” Nichiren being the founder of the Buddhist Nichiren sect ( Nichiren shu – Kuniyoshi being a follower ) and indeed the set of ten prints may have been commissioned to mark the 550th anniversary of his death. Published by Iseya Rihei, c 1831. Like many great landscapes, there exist different states which causes confusion over which is the earliest. The basic difference is that the design is known with and without a horizon line and that there is at least one impression where the uninked, blind-printed line can be seen in a raked light (as indeed it can on this impression). It has been asserted that those impressions without are the earliest; however, it seems from this that the sumi block was probably cut initially with the line but the publishers thought that it looked aesthetically better without printing it, and it was subsequently removed. In any case, this is an extremely rare print and most surviving examples appear to be similar in impression. There is a break in the border to the left of the bottom of Kuniyoshi’s signature which could give a guide to the earliest states, but as this is often painted in, it is not reliable. The composition is based on a design in the illustrated book Bumpo sansui gafu by Kawamura Bumpo, published posthumously in 1824. Although not from a landscape set, this is considered one of the great 19th century landscapes. Fine impression and colour. Beautiful gradation with splashed gofun (oxidised). Slight centre fold, otherwise very good condition. 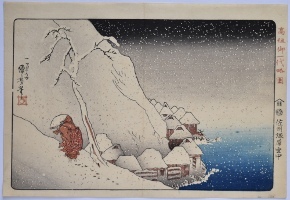 Signed Ichiyusai Kuniyoshi hitsu.